For more information on ToL tree formatting, please see Interpreting the Tree or Classification . To learn more about phylogenetic trees, please visit our Phylogenetic Biology pages. Figure 1: Summary of phylogenetic hypothesis in Rouse and Pleijel (2001). Alternative arrangements are discussed in the Discussion of Phylogenetic Relationships . 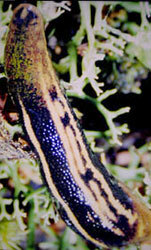 The position of Clitellata/Oligochaeta (includes earthworms and leeches) and Echiura is yet to be resolved. It is now recognized that Oligochaeta and Hirudinea, comprised of several thousand species, form a clade and should be referred to either as Oligochaeta (Siddall et al., 2001) or Clitellata (Martin, 2001). Moreover, it is possible that this group may well belong inside Polychaeta, thus making Polychaeta synonymous with Annelida (McHugh, 1997; Westheide, 1997; Westheide et al., 1999). Echiura (spoon worms), at one time regarded as an annelid group (Sedgwick, 1898), has been excluded from Annelida for many years (Newby, 1940). Evidence now suggests they are in fact annelids (Hessling and Westheide, 2002; McHugh, 1997), though their placement within the group is unresolved. The former phyla Pogonophora and Vestimentifera have also recently become regarded as a single, clearly annelid, group (Bartolomaeus, 1995; Nielsen, 1995; Rouse and Fauchald, 1995), and are now known by the original name, Siboglinidae (see Rouse and Fauchald , 1997 and McHugh 1997). Undoubted annelid fossils, such as Canadia , are known from the Burgess Shale deposits. Until relatively recently the most commonly used system to divide polychaetes was as ‘Errantia’ and ‘Sedentaria’. This was essentially a system of convenience with no real intention of depicting evolutionary relationships. This classification was supplanted in the 1960s and 1970s by ones which split polychaetes into as many as 22 orders with no explicit linkage between them (Fauchald and Rouse, 1997). A recent cladistic analysis of Annelida and other groups has resulted in a new classification of polychaetes (Rouse and Fauchald, 1997), with the group split into two main clades Scolecida and Palpata. Scolecida is a small group of less than 1000 named species, and these worms are all burrowers of one form or another, with bodies reminiscent of earthworms. Palpata comprises the vast majority of polychaetes and is divided into Aciculata and Canalipalpata. Aciculata contains about half of the polychaete species and largely encompasses the old taxonomic group Errantia. Representatives of this lineage are characterized by having internal supporting chaetae, or aciculae, in the parapodia. It includes major groups such as Phyllodocida and Eunicida, which tend to be mobile forms with well developed eyes and parapodia for rapid locomotion. Canalipalpata, a group with more than 5000 named species, is distinguished by having long grooved palp structures that are used for feeding. Canalipalpata is divided into Sabellida, Spionida and Terebellida. Most of these groups’ members live in tubes and use their palps to feed in various ways. The monophyly of Annelida is not well supported and only two morphological features are worthy of discussion; segmentation and chaetae. Nuchal organs represent another possible apomorphy and are discussed in the section on sensory structures (see plesiomorphies and other features ). body in fact represents a series of fused segments (see Hessling and Westheide 2002). Basal annelids, according to Rouse and Fauchald (1997), are taxa such as Clitellata/Oligochaeta and simple-bodied forms within Scolecida. Their trees also excludes Echiura from Annelida. This result was based on outgroup choices such as Mollusca and Sipuncula, and may well be misleading. Alternative hypotheses are therefore worth outlining, though they do not follow normal cladistic practice. Storch (1968), following a detailed study on the musculature of Annelida, proposed that scale-worms, a diverse clade within Phyllodocida, are representative of the plesiomorphic condition for Annelida. He suggested that there was a radiation from this group, but that Chrysopetalidae were most closely related to scale-worms. The implication of his hypothesis is that Phyllodocida represents a paraphyletic group, from which all other polychaete taxa arise. Westheide (1997) (and see Westheide et al., 1999) suggests that the basic (i.e., plesiomorphic) ‘body plan’ of Annelida comprises features meaning that the root of the Annelida tree would be placed with taxa from Aciculata. This would either result in a paraphyletic Phyllodocida or Amphinomida, depending on which taxon is used as the root (Fig. 4). From a molecular perspective, McHugh (1997) found Clitellata, Pogonophora (= Siboglinidae) and Echiura nested among various polychaetes using sequence data from elongation factor 1 alpha in a parsimony analysis (Fig. 4). The placement by McHugh (1997) of Pogonophora as a polychaete group was congruent with Rouse and Fauchald’s (1997) results, but those of Clitellata and Echiura were markedly different. The conflict between this molecular sequence data and the morphological results could be caused by several factors. One possibility is that Clitellata/Oligochaeta and Echiura have lost a number of morphological features that would help identify their sister group among polychaetes. Further morphological study, combined with sequence data, may uncover these ‘losses’ (see Hessling and Westheide, 2002). However, the molecular sequence data sets assembled to date have been marked by both a limited number of taxa and characters. An exception is Brown et al. (1999), where DNA sequence data from three nuclear genes across a wide taxonomic diversity of annelids was subject to parsimony analysis. They recovered some morphological groupings such as Cirratulidae, Terebellidae and Eunicida, but did not show a monophyletic Phyllodocida or Aciculata, nor did they find any parts of these taxa to be basal groups of Annelida. However, some expected groupings were not recovered. Martin (2001) found that the placement of Clitellata/Oligochaeta among polychaetes could not be resolved, and he could not recover a monophyletic Annelida owing to the placement of taxa such as Mollusca and Sipuncula. None of the major taxa used here, such as Palpata, Aciculata, Phyllodocida, Canalipalpata, Sabellida or Terebellida were recovered in Martin’s (2001) analysis. Also less diverse taxa such as Nereididae, Spionidae and Aphroditiformia were not recovered. In a review of the fossil record of annelids Rouse and Pleijel (2001) suggested that the oldest unequivocal fossil polychaetes, such as Canadia from the Cambrian, belong within Phyllodocida. Subsequent fossil polychaetes that can be confidently placed outside Phyllodocida do not appear until the Carboniferous. 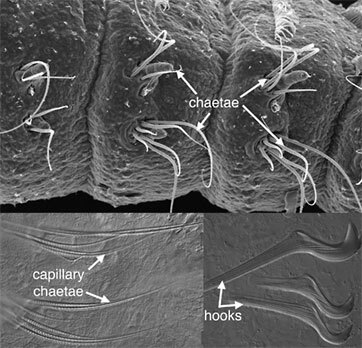 No other fossil polychaetes from the Cambrian can be unequivocally assigned to extant polychaete taxa. There are several likely appearances from the Ordovician, including Serpulidae, Spionidae and the radiation of Eunicida. Ensuing appearances suggest that by the end of the Carboniferous most major polychaetes lineages had appeared. The exception appears to be Scolecida, with the earliest known fossils being the dubious Archarenicola (Arenicolidae) from the Triassic, and one assignable to Paraonidae from the Cretaceous. With the rooting option employed in Figure 1, it appears that some of the earliest appearing fossil polychaetes belong to derived clades (e.g., Eunicida and Phyllodocida). This could be interpreted in two ways: (1) the root placement in Figure 1 is wrong, and so Aciculata, comprised of Amphinomida, Eunicida and Phyllodocida, may in fact represent a paraphyletic ‘stem’ group for the rest of polychaetes; (2) a number of major polychaete clades had already evolved in, or before, the ‘Cambrian explosion’, but fossils have not yet been found. The third possibility is that the overall topology used in Figure 1 may be profoundly incorrect. If we accept that the basic topology shown in Figure 1 is correct, but do not root the tree, then a diagram as shown in Figure 5 is the result. This may represent the most conservative representation of our understanding of annelid relationships. Cuvier, G. 1817. Le régne animal distribué d’après son organisation, pour servir de base à l’histoire naturelle des animaux et d’introduction à l’anatomie comparée. Deterville, Paris. Lamarck, J.-B. d. 1802. La nouvelle classes des Annélides. Bulletin du Muséum d’Histoire Naturelle, Paris An X:Disc. d’ouverture, 27 Floréal (Reprinted in 1907 in Bulletin biologique de la France et de la Belgique 60:56). Purschke, G., R. Hessling, and W. Westheide. 2000. The phylogenetic position of the Clitellata and the Echiura – on the problematic assessment of absent characters. J. Zool. Syst. Evol. Res. 38:165-173. Sedgwick, A. 1898. A student’s textbook of zoology. Swan Sonnenschein & Co. Ltd., London. WormNet . Reconstructing the early evolution of segmented annelid worms. Polychaeta Terebellida homepage . Torleif Holthe, Museum of Natural History and Archaeology, Norwegian University of Science and Technology. Introduction to the Annelida: Everybody’s favorite, worms. . . UCMP Berkeley. This media file is licensed under the Creative Commons Attribution-NonCommercial License – Version 3.0 . Annelida. Segmented worms: bristleworms, ragworms, earthworms, leeches and their allies. Greg W. Rouse, Fredrik Pleijel, and Damhnait McHugh. Rouse, Greg W., Fredrik Pleijel, and Damhnait McHugh. 2002. 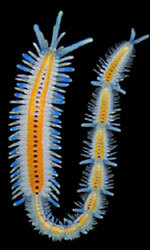 Annelida. Segmented worms: bristleworms, ragworms, earthworms, leeches and their allies. Tree of Life Branch Page. Structure of the Tree of Life page. Tree of Life Project. All rights reserved.